It’s a great pleasure and an honor to be a new board member of the Schumacher Center for a New Economics and at the same time to be here today to hear these illustrious speakers. In his response to the last questioner, Arthur Zajonc took us right to the heart of what Greg Watson is going to talk about. Greg has gone to the inner city; he has gone where I would say angels sometimes fear to tread, into that part of the urban landscape which has been abandoned and polluted, and no one has known what to do with it. Yet it is a community of people who want to take control of their own destiny because if they don’t someone else will. They’ll be pushed out, much like the indigenous people John Mohawk was talking about earlier today. Greg Watson is the executive director of the Dudley Street Neighborhood Initiative, a resident-driven community planning organization founded in 1984. Greg told me the reason why he is where he is today, doing what he is doing, is that he was a great fan and follower of Buckminster Fuller, who was probably the central-most influence in his life. He has met in many ways the challenge Buckminster Fuller would have put to us all: to make efficient use of materials, time, and appropriate technology. Greg was the director of The Nature Conservancy’s eastern regional office; for three years he served as the Commissioner of the Massachusetts Department of Food and Agriculture, where he worked diligently to develop a market for locally grown produce. He was also at one time the educational director at New Alchemy Institute. In the brief moments when I spoke with Greg this morning, I felt the magnetism, I felt the energy, I felt the life force of this individual, who has gone into the inner city and will share with us now his knowledge and his experience redeveloping and resettling a community, which is the future happening now, as Arthur Zajonc put it, and where we have to go. I would like to talk to you today about what is happening in the Dudley Street community of Roxbury, Massachusetts, but before I do, I think I should give you a bit of personal history so that you get a sense of what brought me there. I grew up in the inner city of Cleveland, Ohio, before the time of the Rock and Roll Hall of Fame and Jacob’s Field, when the only claims to fame that Cleveland had were Lake Erie and the Cuyahoga River. As a matter of fact, when people ask me why I as an African-American, especially growing up in the 1950s and 1960s and going to college in the late ‘60s and early ‘70s, have committed myself to the environmental movement, I often tell them that the short answer is because I grew up in Cleveland. Growing up in that city, the only two natural bodies of water I knew were the lake that eutrophied thousands of years before its time and the river made infamous by Andy Newman and his song “Burn On, Big River.” The muddy Cuyahoga literally did catch on fire from time to time. It was so contaminated with flammable pollutants that occasionally a cigarette or a match flicked over the side of a barge would ignite the surface, and it would erupt in flames. Black billows of smoke would fill the air, and I remember waiting for the school bus and seeing black specks falling out of the air and asking an adult, What’s going on? The nonchalant answer was that the river must be on fire again. That was the beginning of my environmental education, and then around 1966 or 1967 the headlines of the daily Cleveland paper, The Plain Dealer, read, “Cleveland’s Air Declared Illegal.” I thought it was another Cleveland joke because we were the brunt of a lot of jokes, but this was not one of them. This was one of the first times a major metropolitan area was cited for having air quality so bad that people were advised to stay indoors, particularly those with respiratory problems. Cleveland’s industrial area, right on the lake, was identified as the culprit. The automobile industry was across the lake in Detroit, and Cleveland supported that industry with rubber, steel, screw manufacturing, and the like. Certain factories were identified by city officials as being responsible for contributing to the poor air quality, but this was before the technology had even been developed to deal with this sort of thing adequately, so the perpetrators were not told how to proceed, but they were told to address Cleveland’s air quality problems. What they did was look for the least expensive way out of the situation. The factory owners didn’t put in scrubbers or filters; they didn’t change the manufacturing process, because they weren’t told they had to. Instead, they took the easy way out—by raising their smokestacks so that the pollutants would go just high enough into the air to let the prevailing winds carry them away from Cleveland. And that solved Cleveland’s air-quality problem! Now, it was at this time, 1967, that I decided to go to Tufts University, outside of Boston. I arrived there only to find that Cleveland’s problem followed me right to the east coast! The reason I tell you this story is because it made very clear to me that the notion of the interconnectedness of the world is not just a fashionable phrase. It is very real. We are all interconnected, and the solutions we seek really do have to take that into consideration because the impact of our technology is no longer just local; it’s also regional and national and global. So there I was on the east coast, and I was working in places like Cape Cod, pristine Cape Cod, where I found a different and more insidious type of pollution. The lakes and ponds looked crystal clear, and I thought, My God, look at this, it’s just beautiful—until I was overcome with the eerie sensation that it was so clean that I could actually see down to the bottom. I could see the rocks on the bottom because there was nothing alive in there. There was not even algae, so there was nothing to block my view. I realized that although this was a different kind of pollution, it was connected to the whole cycle. That was when I decided I was going to commit myself to the environmental movement. You see, having grown up in the inner city, I then took a very long route before coming back to the inner city. The title of this talk is “The Wisdom that Builds Community.” Part of my journey was discovering just where that wisdom lies. I began to understand as my journey progressed that real wisdom is not the so-called conventional wisdom, and I use “conventional wisdom” to describe the wisdom of experts, which we’ve come to rely on over and over again and which certainly has not extricated us from our problems but is digging us in deeper. I realized that real wisdom would have to be found elsewhere. I decided to commit myself to the environmental movement because I perceived it to be just as much of an issue for me, an urban black, as it was for people in rural and suburban areas. This was in 1967: Southeast Asian war, civil rights movement, black power movement, women’s rights movement. 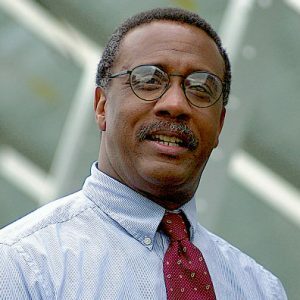 I was becoming involved in some of the nonprofit environmental activist groups when the president of the Tufts chapter of the Afro-American Society, Charlie Jordan, called me to his room and said, Greg, what the heck are you doing? I asked him what he meant. He said, You know, there’s all this going on in the world today, and here you are—fairly articulate, seemingly bright, black, and what are you devoting your time and energy and resources to? The environmental movement. — And I said, Yeah. And Charlie looked me square in the eye and said, You know what, Greg? It wouldn’t even be so bad, from the perspective of the blacks on campus or the Afro-American Society, if the environmental movement were simply irrelevant to our cause. We could almost accept your devoting your time to it, but we see it as much worse; we see the environmental movement as being counterproductive, maybe even sinister, in terms of its motives. I was definitely naive back then. I didn’t know what he meant by that, and I asked him to explain. Charlie said, Listen to the slogans: limited growth; no growth. Greg, where do we, people trying to achieve a certain degree of economic equality, fit into that picture? How can we see that attitude as even beginning to help us meet some of the most pressing issues around poverty and unemployment and the plight of the cities? Now, my first thought was that I couldn’t believe all my years of formal schooling hadn’t prepared me with some kind of response to that question. I intuitively felt, and I think most of you sitting in this room do, that the twin goals of economic equality and environmental quality have to be compatible. You’ve got to pursue both, and they should not be exclusive of each other. But I will tell you that at the time I didn’t have an intellectual response. That really bothered me. Search as I might in terms of my formal educational channels, I still wasn’t able to find one, so I did what a lot of people did in the late ‘60s: I went underground. I started reading things like The Whole Earth Catalog and Small Is Beautiful, and I discovered someone by the name of Buckminster Fuller. It happened one day when I was walking through a bookstore, and a book nearly fell off the shelf beside me. It was called Intuition, and it was by Bucky Fuller, written in a unique poetry/prose format. I read the whole book in one sitting. In it he used unfamiliar phrases like “omnidirectional halos” and “comprehensive anticipatory design,” but the essence was that he was thinking in terms of whole systems. I sensed this was something very important; it was important that somebody understood we might be doing things the wrong way around. Education, for instance: what it does very well is take the world, divide it into parts, and study those parts ad infinitem. As John Todd, director of Ocean Arks International, said, We’re learning more and more about less and less. Education doesn’t give you any sense of how the whole thing fits together; at least the education I received didn’t take one step in that direction. The earth is a beautiful system; it’s a whole system. It’s been sustainably developing—I’m going to use that term “sustainably developing,” not growing but developing—for four billion years. Input from the sun, recycling, regeneration, over and over again; yet not one of my teachers ever talked about the beautiful synergies, about the whole systems, about the emergent properties that appear when the right parts come together in the right proportion. Bucky Fuller makes a couple of interesting observations that you’ll see relate to what I’m going to be saying about the city. He says you can’t predict the whole system by looking at the parts in isolation. For instance, nothing about the individual properties of hydrogen, the gas, or the individual properties of oxygen, the gas, gives you any indication that when combined in the right proportion of two parts hydrogen to one part oxygen, you get water. The properties of water are not suggested in the least by looking at the individual parts in isolation, but when they’re put together in a certain way, a critical change occurs. Similarly, sodium consumed by itself will kill you; chlorine consumed by itself is also poisonous. But when you combine them in the right proportion, the result is something different. Of course, sodium chloride or table salt could still kill you, but it would be a slow kill instead of a quick kill. The implications of the principle involved here are very important: since you can’t predict the whole by looking at the parts in isolation, the best thing to do is to have a sense of the whole system. Looking at whole systems reveals possibilities we didn’t know existed. Have a sense of your vision of where you want to go, and then see what parts you need to bring together in order to get you from here to there. This was a revelation for me; it was a breakthrough in the way I looked at the world, and I will honestly tell you that as a result I never saw the world in the same way again. Now, we hear about being born again; we hear about spirituality, and even though many of us are afraid to admit such things, I will say this was a spiritual experience for me. As a result I began to become—yes, I’m going to use this word, too—an optimist. In these difficult times I became an optimist! An optimist as defined by Fuller is someone who understands that you have options. It’s not saying, I naively believe everything is going to work out and be resolved; it’s saying, Now that I see differently, I realize that there are alternative ways. We don’t have to keep on doing things the same way we’ve always done them. I was still interested in the environment, but shortly after getting out of college, the area that became critically important for me was food, and that is what I focused on. I talked to someone here a few minutes ago from Marblehead, who realized in the course of doing community work there that food is a central issue. Food is certainly central in all of our lives, and it can become an important organizing tool. We know that from community gardens. If you really want to bring people in the city together to work on a common project in the midst of devastation, in the midst of poverty, start a community garden there. In most cases it will survive untouched in the midst of vandalism. It’s the same with murals painted on buildings, and there are obvious reasons for this. Food became a central issue for me because, one, we all need to eat and, two, most of us take the availability of food for granted. Those involved in the sustainable agriculture movement, in community organic gardening, or those who go to bed hungry don’t take it for granted, but on the whole people know very little about the food system. I saw a report put out by the Department of Agriculture in Massachusetts around 1978. It was the first time a state had ever officially taken a look at its food system, and I wondered why it had been done. The reason was that most of the state officials in Massachusetts (although not the Commissioner of Agriculture) were astounded when they found out that we import about 90% of our food, that Massachusetts is dependent upon outside sources for that much of what its citizens eat—and this applies to all of New England. Sixty percent of the imported food comes from California. And where in California does it come from? From the San Joaquin Valley, an area that nature has other plans for. It’s what Marc Reisner talks about in Cadillac Desert, a book with the subtitle The American West and Its Disappearing Water. Nature says, Okay, I’ll let you tinker. You can tinker if you want to. — And that’s what we have done. Here we’re talking about the effects of technology: every natural body of water on the west coast has been rerouted or dammed or restructured so that it can feed the agricultural system there. The Colorado River dries up before it drains into the Gulf of Mexico because of all the demands made on it. The banks of the Mississippi and the banks of the Missouri are reclaimed by nature every so often, and then we’re appalled, and we say, Isn’t this terrible? Look at the poor people being flooded out of their homes. — Yes, of course it’s unfortunate, but why should it come as a surprise to us? We know that area is a flood plain. The conventional wisdom says to build again in the same place. Why? Because the insurance companies want to flourish, and the home-building industry wants to flourish. That’s the conventional wisdom. It makes economic sense to do that. The gross domestic product goes up, doesn’t it? The gross domestic product goes up every time there’s a catastrophe. Real wisdom would say, Don’t build there. Real wisdom would also say, It’s very short-sighted to depend so heavily upon an area of the country that we know nature will at some point reclaim as desert for having supplied us with the bulk of our food. It is the breadbasket of the world; the output has been unbelievably prodigious, but think about it in terms of real time. In real time it has been so for only the past forty, fifty, sixty years. That is nothing compared to the four billion years the earth has been developing. Putting it in perspective, we’re being very short-sighted. Massachusetts decided to try to do something to reduce the amount of food imported, but it had to be something that wouldn’t require a great infusion of money and wouldn’t be dependent upon the federal government. The state came up with a policy that identified a couple of areas they could start to address in order to reduce food importation, such as trying to reclaim some of the farms. By the way, farmland was disappearing at the rate of 20,00 acres per year and 200 farm businesses per year, continuing a trend that dates back to the end of the Second World War. Conventional wisdom said, Why grow food in New England? It’s rocky, it’s hilly, and the growing season is very short. Everybody knows that. — I’ve heard it said that if this country had been settled from the west coast to the east coast, all of New England would probably have become a national park. If we really stop to think about it, is it likely that there would have been six individual states? It’s a great place to vacation: go to the White Mountains and the Green Mountains and go to the beaches of Cape Cod. And then go home! But New England wasn’t “discovered” that way. So what we have are six tiny, densely populated states, and we’re dependent upon others for our food. How can we get around it? Now, I’m not saying we’re going to become self-sufficient, but we have to assume some control in addressing the problem. Conventional wisdom said, Just import the food to New England. Conventional wisdom was short-sighted, not realizing what that would lead to. I can remember back in the early ‘60s when gasoline was 25 or 30 cents a gallon. Transportation costs weren’t that much of a factor when you had to ship food 3000 miles across the country in trucks, but the quality of that food has always been a factor. Take a tomato—a nice, red, ripe tomato that’s growing in your garden—and drop it on your kitchen floor. It does what any good tomato should do: it splats. But if a tomato is going to be transported 3000 miles in a 40-ton tractor trailer over bumpy roads, you have to breed toughness into that tomato—this is technology again. Therefore, you have to breed something out because there’s only so much room in that genetic memory for information. So you breed in toughness and you breed out taste, you breed out texture, you breed out nutrition. For those of us who have bad backs, if you drop this genetically engineered tomato on the floor, fortunately it bounces back to you so you don’t have to bend over so far to pick it up. My point is that the quality of food is affected. The Central Intelligence Agency did a study to determine the average distance food travels in this country from the farm to the dinner table. That’s right, the Central Intelligence Agency; don’t ask me why. They discovered that the average distance is 1400 miles. Unless the vegetables you eat are locally grown, you probably are better off eating frozen vegetables because at least what’s been frozen has some of the nutritional value locked in as opposed to stuff that looks great but has traveled 1400 miles. Perception may be half the battle, but the fact is that we are being deceived. The conventional wisdom has not served us well. Here in New England we depend on fossil-fuel-consuming trucks delivering fossil-fuel-dependent crops long distance while our farmers are going out of business. One of the reasons they’re going out of business is obvious: they couldn’t make enough money to survive. Why is farming uneconomical? If you take every dollar spent on food and divide it up and see how much of it comes back to the farmer, it’s probably somewhere around 7 cents. Where does the rest go? It goes to all the middle people. No, we can be honest about this: middle men. That’s basically who’s running the distribution system and the wholesale marketing system. Every time food changes hands, the price goes up. The money being made in the food system is going to the people who package it, distribute it, put the big elaborate supermarket displays up, and charge slotting fees that have to be paid in order to get a product on the shelf in the first place. The people in the middle benefit. Those on the two ends suffer, and who are they? Farmers and us, the consumers. What are the solutions? For one thing, let’s reestablish the oldest marketing system in the world. Take out the middlemen and make the direct link whenever possible: direct connectivity between consumers and farmers. That’s what’s happening now with farmers’ markets. In terms of community building, in terms of wisdom, farmers’ markets are transparent. You know what’s going on. No one feels exploited. The wholesale system is a black box because you don’t know what’s going on in the middle; you don’t see who’s getting the money. With farmers’ markets the farmer picks the crops and brings them in—to the city in most cases. In areas like the South End, Roxbury, and Dorchester some farmers can make between 25 and 40 percent more by selling directly to consumers. Consumers can usually save 15 to 25 percent, but in some cases they spend a little more at a farmers’ market because the traditional agribusiness is still benefiting from federal subsidies, including water rights. Water subsidies keep agribusiness going. You might think these higher prices would be the death knell for urban farmers’ markets, particularly in poor sections of the city, but fortunately that is not the case. People keep coming back. When I was Commissioner of the Massachusetts Department of Agriculture, we did a survey in which we asked shoppers why they were willing to spend a bit more for the vegetables at the farmers’ market as opposed to buying them for less at the supermarket. One woman with three or four kids in tow looked at us as though we were crazy. Pointing to her children, she said, Because they eat the food. Would it make sense, she asked, for me to save a little by going to Stop and Shop and then have to scrape three-quarters of the food into the garbage because they won’t eat it? At the farmers’ market the peas are so fresh and naturally sweet that the kids eat them raw on the way home before I have a chance to cook them. — That’s real wisdom. Conventional wisdom says, Just get it at the cheapest price. But people want quality; they really do want quality, as shown by the increase in farmers’ markets. In 1967 there were maybe four that had survived in the state; now there are close to a hundred. Farmers’ markets are not going to be the solution. There are other solutions as well. Sam and Elizabeth Smith from Caretaker Farm are here in the audience; they are farmers who are doing work in community-supported agriculture, which means farmers partnering with consumers. Consumers buy shares of a farmer’s crop ahead of time, sharing the risk with the farmer. Subscribers will take some of the brunt if a crop fails, but they’ll also share in the bounty if the farmer does better than expected. In addition to sharing the risk the subscribers are helping the farmers with cash flow by paying for a portion of their shares during the winter. Community-supported agriculture is changing the relationship between farmer and consumer. It’s building community, using the wisdom about how things really work. At the Department of Agriculture we worked with farmers and the dairy industry to preserve the remaining dairy farms in the state. Those of us concerned about quality of life and the rural character of our New England landscape know how crucial this is, whether in Massachusetts or Vermont or New Hampshire. In Massachusetts alone, dairy farms account for about 300,000 acres of open space. When the dairy farms go out of business, quite apart from the loss of milk, that rural character is also threatened. Farmers are going out of business, largely because they’re relying on an antiquated marketing system based on something called the Minnesota/Wisconsin scheme, which determines the price farmers get for milk according to the distance you happen to be from Eau Clair, Wisconsin. I’m willing to bet that there are more people in this country who understand quantum physics than who understand how milk is priced. It is such a complicated system that the fact that it is uneconomical and doesn’t make sense is obscured. Both farmer and consumer suffer as a result. At New Alchemy Institute, where I had the privilege of working for a number of years, the kinds of questions being asked were, Can we develop technologies that are designed to preserve whole-system integrity? Can we develop systems that don’t rely on chemical fertilizers, pesticides, or herbicides in order to grow food? Can we grow food year round in passive solar greenhouses that don’t depend upon fossil fuel inputs? The answers were, Yes, we can; Yes, we can; Yes, we can. We can build bioshelters or greenhouses that actually support fruiting fig trees and banana trees and don’t require any backup system of heat. We can grow enough food on a tenth of an acre of land to feed thirteen people three vegetable portions a day for a year without the use of chemical fertilizers, pesticides, or herbicides. It is possible to do all this. Therefore, I’m an optimist, because I know that options exist. Co-founded in 1969 by John Todd, Nancy Jack Todd, and Bill McLarney, New Alchemy flourished on twelve acres in Hatchville, Massachusetts, on Cape Cod as an amazing research and education facility and incubator that pioneered work in the organic gardening and appropriate technology movements. It is probably as responsible as any other organization for having encouraged what we now call sustainable development, whether you accept that term or not, and for having demonstrated how we can integrate and merge environmental and economic concepts. Although it closed its doors in 1991, New Alchemy is still very much alive, and its ideas are spreading. The Todds have expanded their work at Ocean Arks International, where they are applying concepts developed at New Alchemy to waste-water treatment systems; Gary Hirshberg, who was executive director at one time, is running Stonyfield Farm, which produces organic yogurt up in Wilton, New Hampshire; Ron Zweig, who developed the integrated aquaculture system in a type of greenhouse called the Cape Cod Ark, is working at the World Bank, their first and only aquaculturist, where he is looking at how to apply aquaculture to projects in the developing world; Linda Gusman is in Hawaii doing community-based aquaculture work; and I have been fortunate enough to take a bit of New Alchemy and see if it is appropriate for transplanting into the inner city. The Dudley Street Neighborhood Initiative is an incredible organization serving an incredible community. I can say that because I had nothing to do with its founding in 1984. I’ve been there for only two and a half years, so others share the credit for its success. DSNI is a community-based planning and organizing entity in Roxbury, Massachusetts, two miles south of downtown Boston. The Dudley Street neighborhood is one of the poorest communities in all of Massachusetts, with a population of 24,000 Cape Verdean, African-American, Latino, and white residents and with one of the highest rates of unemployment and poverty anywhere in the state. We’re not a district, we’re not a neat political unit; we are basically an area that was defined by devastation and poverty, an area that has suffered in a number of ways—suffering sometimes even caused by well-intentioned policies and practices. The cumulative effect of this devastation was that by 1984 the Dudley Street area had been reduced to 1300 abandoned lots filled with rubble. You could stand in the middle of the one and a half square mile area that we call the Triangle, and you could literally turn in all directions and not see a building. It was an absolute wasteland, where once there had been a thriving Irish-Catholic and Jewish community. One of the programs contributing to the changes taking place in Roxbury was the G. I. Bill, which encouraged returning servicemen and their families to go and build homes in the suburbs. And over the years many people did leave the area. Redlining, abandonment, and neglect followed. When immigrants came in from Cape Verde and Puerto Rico, the community changed its character still more, and again people left. The Dudley Street neighborhood became an enclave for the poor and the disenfranchised, and in many cases residents were not citizens of this country. There were a lot of slumlords in Roxbury who were hoping for urban renewal to make them rich. They were waiting for the same thing that had happened in the West End and the South End of Boston. They were going to hold on to their property until they could make a financial killing. But the community said no. They didn’t want urban renewal, and they stopped it. As a result you had a lot of people holding land and buildings they didn’t know what to do with. They realized they weren’t going to make their “killing,” but they were determined they weren’t going to suffer, either; they were going to minimize their loss. The way many of them did this was to burn their buildings down. Night after night after night there were fires. Everyone on the outside said, Oh look, they’re burning down their own homes, they’re destroying their own communities. What’s wrong with those people? — It was not the people living there who were destroying their community; it was the slumlords who were burning down their own buildings in order to collect as much insurance money as they could on what they perceived to be a lost cause. They burned until the whole area was virtually flattened. Imagine 1300 abandoned lots in the middle of a community! As Wendell Berry reminds us, once land is neglected, or looks neglected, it soon becomes even more neglected. Trucks frequently drove through or past Roxbury on their way to the dump, where they were being charged tipping fees to deposit their trash. When the drivers saw all the abandoned lots with no people around, they thought, Why should I pay a fee? So they’d come back after dark, and they’d dump their loads. Then they got so brazen that after a while, because nobody seemed to care, they’d come in the middle of the day and dump. There were sides of beef, there were old refrigerators, there were cars, there were rats and other vermin, there was filth. People were becoming increasingly ill, and finally the community said, No more. Then the residents called Mayor Flynn back, and they said, There’s something else we need. He thought, Well, that’s okay; they probably just want more rakes and shovels. What the community said was, We’re going to develop a comprehensive plan to rebuild our neighborhood, and in order to do that we need control over the land, so we’d like the power of eminent domain over the abandoned land in our community. Mayor Flynn gulped and balked at that one; that wasn’t what he had expected. But they made a case for eminent domain. Many people rejected the idea. Even in the community there were those who said, No way. That’s the very tool that has traditionally been used to force poor people out of their communities. We don’t even understand the nature of that power. How do we know we could use it wisely? — The residents held many meetings. They were very deliberate, they thought things through, and they decided that in order to rebuild a wasteland with hundreds of individual owners, they had to have control over the land. Conventional wisdom says that wealth is having a job. Let’s bring in Wal-Mart, let’s bring in IBM, and they will give the people jobs. That’s not real wealth. Real wealth means you have some assets. It means you build on something that the community owns or that the individuals in the community own. There’s no more valuable asset than land. Farmers know that; we know that. The land is the ultimate source of wealth. So through hard work and with the support of Ray Flynn and Stephen Coyle, the director of the Boston Redevelopment Authority, in 1988 the Dudley Street Neighborhood Initiative became the first and to date only community-based organization to be granted the power of eminent domain over a one and a half square mile area right in the heart of Boston. The Ford Foundation came forward with a two million dollar loan to buy the abandoned parcels of land at fair market value. If there was a building on it, we couldn’t buy it; if the land was taken care of, we couldn’t buy it. What we were interested in were the parcels that were overgrown, that still had trash on them, that were attracting vermin. And because we weren’t acting as individuals but as a community, we formed a community land trust. A community land trust means what it says: land held in trust by the community. It is a democratic, nonprofit vehicle that removes land from the speculative market and holds it for multi-purposes: affordable housing, farming, small businesses, open space. The community land trust uses long-term ground leases to give area residents affordable and secure access to land. Residents own their own homes and pay a small monthly fee to the trust for the use of the land. Resale provisions on the homes ensure that homeowners will receive a fair return on the investment in the building, at the same time excluding the value of the land—which has been enhanced by the efforts of the entire community—from the sale price. In this way the homes remain affordable for future residents. Two hundred and twenty-five affordable homes have been built in and for our community: duplexes, single-family homes, town houses, row houses. The type and location of every single home were determined through a public process. Through sale of the homes and collection of ground-lease fees we were repaid for the cost of land purchase. The development effort was therefore self-supporting. We never had to use one dime of the two million dollars of Ford Foundation money, although it did provide the Initiative with credibility in its initial stages. New Alchemy Institute dealt with physical technologies—greenhouses, windmills, fish farms; there’s another alchemy, and I’m going to call it civic alchemy, because it’s the community that makes things happen. It’s not enough to know you have the technology. You have to ask, Is this really an appropriate technology? Is it really going to benefit the community? Is it really going to enhance the process of empowerment and community building? And how do we make that happen? The community land trust was the answer to the last question. It was one part of a neighborhood system of self-governance. The Dudley Street Neighborhood Initiative created its own governing board, a 29-member board of directors elected by the community every two years to guide the Initiative’s planning and organizing efforts. These are public elections. Candidates for office campaign, and they take their role as community representatives very seriously. Who plans our community? Not the experts. We’ll use experts, but we don’t want them to come and tell us what to do. We may consult with experts in order to understand how to get something done once we have determined what it is we want to do. It’s the community that then selects the developers and the architects. The architects have to come and present their designs at community meetings, and the residents do turn out for these meetings. This is participatory democracy and participatory planning at work. We’ve talked to professional planners, we’ve read the textbooks, and we’ve had the consultants in, but if you want to know who’s guiding the Dudley Street project in Roxbury in terms of its strategy for urban revitalization, it’s Jane Jacobs. Read The Death and Life of Great American Cities, The Economy of Cities, Cities and the Wealth of Nations; now, there is real wisdom. The wisdom we gain from our process for the most part comes from sitting around, maybe with a group as large as this one, attacking a problem and realizing that what we need to solve the problems facing us is collective wisdom. Bucky Fuller said that as each human evolves, we each represent a potential way the universe could have evolved in terms of the principles embodied in how we develop. We want to tap as many of those universes as we possibly can. And that’s really what the process at Dudley Street is doing. In 1987 a comprehensive plan was developed with the assistance of a consulting firm called DAC, International. That plan laid out the vision for the creation of an urban village. It integrated housing, economic development, delivery of human services, and open-space needs, offering a model for a twenty-first-century village. This village suggests a certain scale, which limits the kind of businesses we’re looking for: we don’t want an anchor store or industry. An anchor is something rigid that you plop down to stay in one place. We’re looking for trim tabs. Bucky Fuller said the trim tab is one of the most important principles of what he called comprehensive participatory design science. If you understand a whole system, you’ll understand that there is at least one place where you can apply a trim tab, which is a nautical or aviation term. In order to change the direction of a large oceangoing ship cutting through the water at a good clip, you have to apply a great deal of energy because the ship has built up momentum and the water has density. You have to overcome the momentum of the ship and the density of the water in order to turn the rudder. If you know just where to place a little flap at the trailing edge of the rudder, right above the surface of the water, you can turn that flap relatively easily. When you do, it creates a partial vacuum that turns the rudder, and then the rudder turns the ship. So if you understand whole systems and know where to place the trim tab, you can change the course of large systems with minimal effort and energy. You don’t really need that long a lever; no, give me the trim tab. It’s a good strategy to look for that trim tab instead of an anchor or a savior. We’re looking at the trim tab approach to developing the community. Civic alchemy is about process. The reason so many people are afraid of the process is because it’s messy. But there’s no way around the messiness. Community process is muddled. It’s time consuming, it’s aggravating, it’s frustrating. If done right, though, it’s also beautiful, and it works. At lunch earlier, Joanna Campe was talking about teetering. We’re always teetering on the cusp between success and failure, order and chaos, and that is the honest truth. In a process like this, because there is so little precedent for what we’re doing, we are always teetering on the brink. Our success depends upon the faith we have in the process. There are times when the muddles get so bad that we’ve gotten stuck on a point for three or four days or even weeks. The inclination for most folks would be to say, That’s it. Or to let the director or somebody else come in, make a decision, and get it done. But as Joanna said to me, If you allow the process to go through, what you will understand is that the breakthroughs often come as a result of breakdown. When the process breaks down, we have to say, We can’t do it within this framework; we have to jack our thinking up to another level. So what kinds of new solutions did we come up with as the basis for our economic development strategy or as a major trim tab? One is urban agriculture. We’re going to have a community-supported farm. We already have one-and-a half-acres in production. We have a farmers’ market right on our town common. It was part of one of the vacant lots that has been redeveloped into a public space. Now we’re building a bioshelter, modeled after the Cape Cod Ark at New Alchemy Institute, a beautiful structure that will integrate agriculture and aquaculture systems within a passive-solar greenhouse design. It’s going up on a brownfield. “Brownfields” are sites whose pollution or perceived pollution makes them unattractive for any type of development, in contrast to “greenfields” or virgin parcels of land. Our urban areas have an abundance of brownfields; greenfields, on the other hand, tend to be located in suburbs or rural areas. The current dynamic between brownfields and greenfields leads to sprawl, resulting from the abandonment of urban areas by developers for cleaner (in both the environmental and legal sense) greenfields in the suburbs and countryside. Just so you get a sense of the challenges facing this community as it rebuilds: we have fifty-four identified hazardous waste sites in our one-and-a half-square mile area. Currently, we still have thirteen trash transfer stations. We know that the trash has to go somewhere, and things have to be recycled, but we think that thirteen within a one-and-a-half square mile area is too many. We have to do something about that, and I’m totally optimistic that we’ll be successful. So we still have to organize and fight the battles that need to be fought, but for the most part we’re organizing around a positive vision. Organizing doesn‘t mean that you always have to be confrontational; it doesn’t mean that you have to identify an enemy. It can mean that you identify a shared vision and mobilize residents to make that vision a reality. The Dudley Street Neighborhood Initiative is not your traditional community development corporation. We see creating that shared vision as its primary goal. We have facilitated the process that brings the community together, with all the stakeholders in the community—and that includes not only the residents; it includes our small businesses, it includes city and state and federal agencies—trying to agree on our vision and then on a strategy to get us from here to there. Now we are attempting to demonstrate a real, honest-to-goodness model of a livable—not just livable, desirable—urban community. If we can do that, and I think it’s happening, the way people think about revitalizing urban areas will change. What we really want is a city of villages. We want density; we need density. We thrive on density. That’s what cities are built for. Suburban sprawl is a big problem, but we are saying, We want to bring back the people who left Roxbury for the suburbs. When we rebuilt homes, the first people who came in and bought the homes were people who used to live there. That was their home once, and now it’s home again. They couldn’t be there when it was 1300 abandoned lots because there was no place for them to live. Now there is a place. Now they can return home. Dudley Village will become an extraordinarily vibrant multicultural urban village, where the cultural diversity, just like the diversity in nature, is a source of economic strength. You won’t see a Wal-Mart or a Burger King as dominant parts of our economic landscape. What you in fact will see are Cape Verdean, Puerto Rican, African-American, and European restaurants; you’ll see locally owned clothing stores and craft stores selling exciting and unique ethnic products. Ten years from now, maybe as soon as five, I guarantee that when your friends or relatives come to visit Boston, they’re going to say, If we’re going to be in Boston, we have to go and see Dudley Village. They’ll want to see the realization of our urban vision. People are already coming for tours to see the community that raised itself from the ashes. We’re getting visitors from all over the country and even from as far away as Germany, Japan, France, and Russia. We’ve been asked to do seminars on community organizing. People from Russia say, We don’t know how to make decisions as a community. For such a long time we were in a system where decisions were made for us. Can you help us understand how to organize ourselves and plan as a community? I don’t consider myself an economic development specialist, but it’s become clear to me that we have a “captured” market. People are coming to us not only in person, they’re visiting us over the web as well. We have our comprehensive plan, the DAC plan, but you can’t find it in libraries; it’s not written as a book yet, although there is a book about the DSNI. People were asking, How can we get hold of your plan? The answer was to put it on the web. So the Citizens’ Participation Network at Brandeis University, funded by the Surdna Foundation, has put it on the web. They also put our urban village visioning-report there, and we get a lot of hits at that website. One of the things we want to do is advertise our village products on the website. Why shouldn’t people be able to buy Gladys’s Homemade Soffritto over the web? Why shouldn’t people who may never even set foot physically in the village be able to visit our “virtual village” marketplace so that they can buy village products? It is this technology that may help our village cottage industries to thrive by giving them exposure to regional, national, and international markets. Why would people want to buy village products? Because we’ve established ourselves as a special place, just as Vermont has done. Remember? First it was Vermont maple syrup. Then people would buy Vermont cheese, and that made sense; they might buy other milk products, such as Ben and Jerry’s ice cream, and that made sense. But what are they buying now? Everything from pizza to salsa to potato chips. Vermonters have taken advantage of Vermont’s identity and marketed it wisely to support local small businesses. Well, the same thing can happen now in this very exciting and culturally diverse community of Dudley Street. Other people will want to experience a part of a village like this. I’d like to leave you with our vision of a vibrant multicultural village, which has in fact risen from the ashes and which has used wisdom, the wisdom of the community, to build and revitalize what was once a devastated area. Q: According to World Watch Institute, by 2015 China will have to import more food than the entire world can export, and with development running as it is elsewhere, we can expect that the prices for food in commercial markets are going to keep rising. As I understand it, under the free-trade arrangement if you have something you want to sell, like timber or food, if it is out in the market, you are required to sell it to the highest bidder, even if that bidder is from across the world. Now, if those kinds of things are going to happen, how are you going to preserve this village, this situation which sounds quite beautiful? A: Let me try to answer that indirectly because we haven’t yet addressed the challenges of the North American Free Trade Agreement. We haven’t had to deal with it directly yet, but I will tell you that we are looking at what we can do to start putting safeguards in place. When I first came on at Dudley Street, I had remembered reading Jay Forrester’s book Urban Dynamics, published by MIT. He did a systems-dynamic analysis, looking at how cities can rebuild themselves. He also had a model that showed you have to be careful because if you put too much emphasis on affordable housing first and not enough on economic development, you set yourself up for failure. So I reread the book and then gave Jay Forrester a call. He said, I know about your project. Let’s talk; I’d like to hear more about what you’re doing. When we met with him, he suggested that we had set ourselves up for that failure, but then we described our urban village strategy. The next week he came back and said, I think this will work, but you have a problem: How will you preserve your village? How, for instance, will you safeguard against high land values and superdevelopment and exploitation? The cost of land will inevitably rise as the value increases and as more people come in and housing develops. — We told him, among other things, about the community land trust concept. We told him we limit the profit that can be made from the resale of any home we build within the land trust to 5%. We do this consciously to avoid the problems that go with speculation and to ensure that community people can continue to afford to live in the village, even as its value as a desirable neighborhood goes up. The bank we were dealing with said, This is crazy. You can’t market these homes, because people are going to look at them as stepping stones, as an investment. All we said in response was, The risk we’re taking is that we think we can sell the homes to people who aren’t buying them as stepping stones but because they want to live here. We’ll soon find out if we’re right, because if we’re not, nobody is going to buy the homes. — Of course, as it turns out, they’ve all been sold. To answer your question: I’m hoping that those are issues we’re going to address. We probably do need to look at them before long. One other point that your question brings to mind is that the community has also embraced a local currency, and this is a tribute, more than to anyone else, to the folks here at the Schumacher Center, who have made it a part of their overall economic development strategy. A local currency is not just a gimmick and not just a cute idea; it’s an integral part of the community-building process. Import substitution is one of the major areas we need to consider as we look for strategies and opportunities for economic development. Roxbury residents are spending millions of dollars each year on purchases, but they’re capturing only a tiny fraction of that amount within the greater Roxbury area. What are the possibilities that the products and services now being purchased by Roxbury and Dudley residents from outside the community could be produced there instead, so that the money spent on them stays in the community? Q: How do you relate to the broader electoral struggles that are occurring, particularly the New Party’s efforts in the Greater Boston area, and do you see yourself becoming more active in the electoral arena as progressive movements begin emerging across the country in the next decade? A: We have to become more active, but to be honest, we’ve had greater participation in our own local governing process than we have in the electoral process. But, as many folks are now beginning to say at our community meetings, the leverage we’ve gained as a result of the eminent domain process and our success in the past won’t be sustained unless we encourage residents to participate in the broader process—whether it’s through the existing political parties or by looking at some of the alternatives. If the attitudes of the residents are any indication, my guess is that the tendency would be to look at some of the more progressive alternatives as opposed to the existing system. For the past three years we’ve been actively involved in both voter registration and voter education, so it’s an integral part of what we’re doing, but our track record in the past has not been a very good one. This is mostly because people have become so disenchanted. We’ve got to turn that around now and translate the disenchantment into something more positive. Q: In connection with your urban agriculture, have you tried using any Living Machines as designed by John Todd? A: One of the major projects we’re undertaking right now is to clean up one of our polluted areas with over three-quarters of a million dollars from the Massachusetts Highway Department. It’s a former garage where there were oil and gasoline spills. We had a community meeting to determine how the residents wanted to use this parcel once the garage is torn down and the land is cleaned up and reestablished. Actually, it’s a collection of parcels. I served as facilitator at a couple of community meetings, and we came up with a few options for what could be put there. We brought some folks in to talk about urban agriculture, and then the community voted on a sustainable greenhouse/bioshelter. John Todd is one of the people we’re encouraging to submit a design and participate in this process. We drafted a request for proposals with a description of what we’re looking for, and the fact that we want a passive solar structure that can accommodate both aquaculture and agriculture as integrated systems means there may not be many others who are qualified to do that. I was interested in Arthur Zajonc’s comment about the emergence of, in Peter Drucker’s words, the social sector as represented by nonprofit and community-based organizations. This is sometimes referred to as social entrepreneurship, and it’s something we do need as a counterbalance to what’s going on in the corporate world, where entrepreneurs are lauded and supported and encouraged to do their thing. I think we’re seeing some innovative and creative approaches in this area. I’m not downplaying the seriousness of the challenges that face us, but I also see the opportunity; I do see folks understanding that they should mobilize. The social sector may exist in name and in concept, but it doesn’t yet have a sense of its significant cumulative resources. This situation could change. If the churches and other nonprofit organizations that do have resources, such as land, were to make some of it available for community development as we have done in Roxbury, it would be a major step forward. I’m just looking at this from an organizing perspective. There are resources, and we should be a little better about insisting on how those resources should to be used. The truth is, there’s a lot of money available. There is even a poverty industry. In our community people talk about the poverty pimps. Starling Childs talked about going places where angels fear to tread and nobody, or very few, wanting to get involved in places like Roxbury and Detroit. Nine million dollars went for a seven-year study of community and social engagement and “bowling alone,” and the people conducting the study never set foot in the community. Do you know what they found after seven years and nine million dollars? They found that neighborhood associations contribute to neighborhood cohesiveness! Those resources should have been funneled to the folks who are on the ground doing the social entrepreneurial work, who are the change agents, instead of going to those who conduct a study and then benefit as a result of being in the right place at the right time. There are plenty of resources, but they need to be rechanneled. During the crisis in agriculture when people started focusing on sustainable agriculture, the entire Office of Sustainable Agriculture of the U. S. Government consisted of one person, and that’s pretty much what exists right now, even as we’re going through these tremendous changes. As we look for solutions, we owe it to ourselves to develop a whole-systems approach and not be satisfied, as we often are—myself included—with just saying what’s wrong with an existing system. Are we who are interested in sustainability and community-building willing to shed our preconceived, hard-held notions about what’s right? If we can begin to get established members of the social sector to work with grass-roots neighborhood groups such as DSNI and see if we can identify a shared vision, then maybe together we’ll find ways of encouraging sustainability. I remain optimistic—both in the short run and in the long run.